What a classy room! It must have been a treat to dine in this grand room. The Hotel's current incarnation as a retirement home is actually almost as impressive. Does anyone know, was this the "Bib and Tucker Room"? According to sources in the know it wasn't called the Bib and Tucker. Kim Plant, who was a waitress there, said "No, the dining room was not called the Bib and Tucker. The Bib and Tucker was the bar (it had those incredible frosted glass/etched doors, and I think "Bib and Tucker" was above the doorway, also in frosted glass. 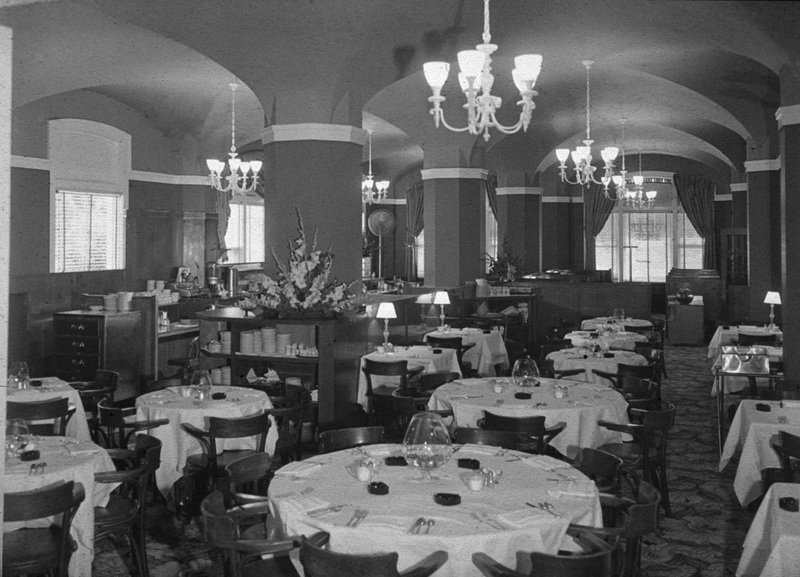 The King Cole room was where they held banquets, and as it adjoined the bar, it opened up for major concert events or big ol' holiday events. That's basically correct. My step-father, Wally Bullard, played at the locally famous piano bar in the Bib & Tucker Room, attracting local "big wigs" on a nitely basis. There were no big hotel chains in Eugene back then, so basically, anybody who WAS anybody, local or visitor, ended up at the Eugene Hotel at the Bib and Tucker Room. Wally would pass them the microphone, they would tell him what song they were going to sing, and Wally would perfectly accompany them, simulataneously playing his piano and his Hammon organ with a Leslie speaker. When Billy Joel wrote the song "Piano Man", Wally told me, "That's my life- I could have written that song" Wally,the Bib and Tucker Room,and most of the local gentry who spent their evenings there, have since moved on, but I got to see it-in glimpses, since kid's weren't allowed in the bar. Regulars and visitors alike, elegantly attired, passing the mike around, and singing Sinatra and Nat Cole songs, while my Dad played his heart out, with one eye on the crowd and the other eye on the tip jar. What a time it was! The original "Social Network" and the only keyboards belonged to Wally!